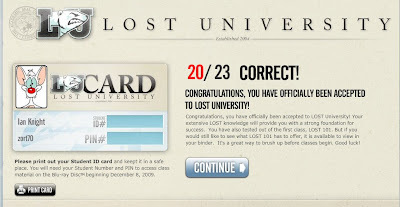 On the 22nd of September, the day of the Oceanic 815 crash, the enrollment for Lost University has started. As you can see there is also another page of news. This apparently means I don't have to take the Lost 101 class, but others have reported that they have been asked to take it. The Lost 101 class seems to consist of a video about Lost, there may be more questions for those that have to take the class. Also as you can see from above there is a student id card which we can all print out, with our student id and pin number on. One final thing, the answerphone message on the phone number given out at ComicCon has changed, it now mentions tutoring and that the professor will be back for the December the 8th start of the Univesity Classes. 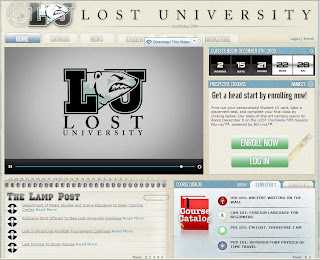 Have you seen that the Lost University T-Shirt is product number 108 ! There are already a lot of posts in the forums on LU. Looks like T-shirts are already sold out? Well they say Sold Out and coming soon, so I think the sold out may just be a mistake. I've started a Lambda Alpha Sigma thread for us on the Lost University forums. I don't have blu-ray either. Was thinking about getting a player for this. But after doing some research found out I can't just buy an inexpiensive player because most of them don't have profile 2 aka BD live. So now I'm torn. I don't won't to spend 200 - 300 dollars for a player for something I'll only use once. (as far as the BD function is concerned)But I really want to participate in this. I guess I'll justsit on the sidelines and watch with you. I got a 22 out of 23. I know which one I missed. I knew it was wrong when I chose it. But I'm stubborn. I have 2 questions. Why won't my picture center on my id, and how do you put a profile pic on your posts in the forum? I did absurdly bad on the test (18) and still passed out of Lost 101. Sayidsgirl, I had to try and position mine off center so that it was centered when it got saved. Ok zort thanks. I've tried several times. I've put it off center and resized it but when i save it,it stays the same. I'll keep trying. BTW I'm Tess01 at the LU forum. morning. I've been caught 'cheating'! Hestitation at LU is a no-no. It was the Goodwin chicken that got me. I kinda like my half-face pic. But I don't like being LotteryTicke. Can't you share another space, brother? At the moment, I have no players DVD/Blu-ray either, with exception of my laptop. I run that through the TV when I need to watch DVD (which isn't often). Some new laptops have Blu-ray drive (not sure that they are BD-live). A purchase decision will have to be made. I see extra work hours in my future. I've got a Playstation 3 which doubles up as my only blu ray player. The firmware was updated some time ago to allow BD-Live to be used. Now LU won't let me log back in. I was reading the forums and went back to work on my id again, I was prompted to login. But I keep getting a login error!! Oh well try again later. Zort: I have the PS3, too...is a fabulous Blu-Ray player! Sayid'sgirl: I had the same picture problems, just kept doing it over and over and it finally took. It seems when I started playing around with the "size" icon...making my portrait smaller to fit perfectly in the box....it took finally! I got 21/23. Wonder what "failing" was? Finished watching vid in Binder. The use of 'seemingly' over and over and over. And there's that 'Kate taking the booths off dead person, orange-mouth Locke' clip AGAIN. Yuhoo - 21 out of 23 :) Googled only for taweret. FYI For those of you who missed it. At midnight the countdown clock showed heiroglyphics and the whole site did a System Failure. There's pics in the Lostpedia forums. 23/23, wish I had done that well in school. To whom are you referring to? Anon - the pics look good. I was asking Lottery_ticket about "caught cheating"? Well I finally gave up trying to login and emailed that I forgot my password. They sent me a generated one and I'm finally logged in again. Happy Lost Day! Can't believe Oceanic 815 crashed 5 years ago today! Yes I'll re add my Happy LOST anniverasry day. I posted it in the last post. Thanks Maven for the tip to fill the square with my picture it worked. I've just had an email from LU informing me I can sign up ! Signed off by Greggory Nations, a producer of several episodes. "...the first 108 graduates will receive a hand-signed diploma from LOST University Presidents Damon Lindelof and Carlton Cuse"
Has anyone tried any of the calsses yet, to earn credits? I was thinking the same thing. No blu-ray no graduation. Ah well. My bets are for the clue to arrive about midnight UK time, but I'll be asleep before that happens. I mean the DCaaPB clue, not LU, there are so many things to keep track of ! I'm not sure I will wake up tonight, we have had a new bed delivered, and I'm going to give it a good test tonight. It's possible the clue won't be tonight, if the event isn't until tomorrow night. The Crumbs thing was only about 8 hours notice. You could be right. The clue to the Crumbs location was given after I went to bed. By the time I took my daughter to school and checked in the url was already up. Gah I can't enroll! I don't know what's wrong. I fill in everything and then it's says error. Help anyone please? 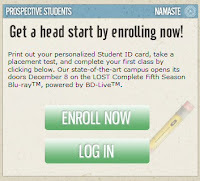 I know i cant enroll either. help? Lost Class of 2010 t-shirt arrived today. Very nice. It says there was an error and that i can't enroll. i know i filled everything out correctly so..whats wrong?! what should i do..any suggestions?